After reading the above articles carefully, part of me felt inadequate to comment. Who am I to comment as I am neither a professor of journalism ethics nor a psychologist. But in an age where anyone with a Twitter, Google+, Facebook account can comment freely and sometimes forcefully with expletives, I hope my ramblings/observations may shine some light. 1) Referencing this WaPo report, I agree with NPR’s approach in “advising their journalists to get a parent’s permission in writing or on tape before interviewing a child.” To me, parent’s permission and parent’s ability to stop an interview at any time is a most basic requirement. If an interview is stopped by a parent, then that clip (live or pre-recorded) should not be used again, ever. That interview, by agreement between media outlets should be treated as never happened. 2) I would trust reporters on the ground more and not go as far as ABC News. “ABC News also said Friday that it doesn’t air interviews with children live, but records and reviews them before broadcast.” I want to think media outlets send good reporters to report violent tragedies to begin with. They should believe in their reporters enough that they will do their job ethically. The final editorial decision may not help much if the source materials have been gathered unethically anyway. 3) I cannot and will not tell reporters to simply “Turn Off the Cameras“. As long as the tools and methods used by the media outlets are legal, I see it a danger to “freedom of press” if we (the public) start dictating to the media what is acceptable or unacceptable tool to use or report to air. Ideas of no interview “zone” or no interview “age group” (too young even with parental permission), etc are dangerous precedence to set. 4) Some good points were made in WaPo that I cannot fully agree. I see the point made by the child psychologist. At the same time, I feel I must balance the potential emotional impact of the child with the public good of having an interview done right there when all eyes are on the scene of the tragedy. A professional lit at home/school interview with the affected children with their parents sitting besides them a few days later will not have the same impact. To me, seeing the children speaking in their own unfiltered voices at the scene right after the tragedy is of critical importance. It is not just the “facts” that I am after. I want to know how the children feel. Seeing the children there was painful and very emotional to me but the reporters on scene are not the ones to blame. The reporters didn’t cause the tragedy. They were there to be our eyes and ears, to find out relevant information to allow us, if we choose to, be informed citizens (world citizens). Now let me talk about Vietnam Napalm Girl Photo, the second half of my title. Ms Phan Thi Kim Phuc is “a Vietnamese-Canadian best known as the child depicted in the Pulitzer Prize-winning photograph taken during the Vietnam War on June 8, 1972.” To me, the Vietnam Napalm Girl Photo was one of the contributing factor to the end of the Vietnam war. In June 2012, Kim Phuc told friends and relatives at an event marking the 40th anniversary of the photograph that made her famous, “I never thought that the child who was a famous symbol of war would one day be invited to become a symbol of peace”. At heart, I am an optimist and see the world is capable of becoming a better place over time (hopefully with a small contributions by me). My hope is the painfully emotional interviews with children right at the scene of the Elementary School shootings may lead to meaningful actions by the American public. What if those interviews with children play a role in turning the American gun culture around? Witness White House Press Secretary Jay Carney on Friday repeating the standard & pointless “today is not the day for a debate on gun control.” To the 180 degree change by President Obama a few hours later, “We’re going to have to come together and take meaningful action to prevent more tragedies like this, regardless of the politics“. I don’t normally say this but let me say, “God Bless America” and may you make the changes needed to avoid future tragedies. As an independent reporter who has no formal j-school or ethical training, I have to remind myself if I were ever at the scene of tragedy and violence, I will have to be mindful of what am I doing and why. The price I pay for releasing the shutter or pressing the video record button is a piece of my humanity. While I am being paid to do my job, the “public good” must also justify the lost piece of my humanity. P.S. Based on all the interviews with children I’ve seen, which by no means is exhaustive, none of them have crossed the “ethical line” to me. In case of tragedy, I find comforting to not set fixed rules but lean on the “I know it when I see it” standard. This article is cross posted to examiner by me. I agree with with Kelly that children should not be “exploited for the media’s profit and to sensationalize it” but like I try to argue in the article, as long as the interviews are ethically conducted, important public good can be served by these interviews. My good friend Gingi Baki asked me: who is the most interesting person you met at Banff 2012? Tough question! You see, I have met television creatives & luminaries like Chuck Lorre, Glen Mazzara, Jeanne Beker, Mike Fleiss, Terence Winter and I can easily put any one of them on my “most interesting person” list. But if I do that, I will be doing a diservice to you. What would you gain if I name any one of them? Nothing! Because you know them already. Instead I will share with you a name that, unless you are in the “business“, you may not heard of. To me, the most interesting person I met in #banff2012 is Paul Chard, Global Head of Content of MediaCom. I half-jokingly asked Paul to not hold it against me that I’ve been a big fan of Kevin Roberts (blog) (CEO Worldwide of Saatchi & Saatchi). You see, I’ve been reading Kevin‘s ideas/writings since the late 80s. You may not realize but the parent companies of Paul and Kevin are the globally competing WPP Group and Publicis Group respectively. (update: Paul showcased the #awesome T-Mobile Royal Wedding video in his presentation, and I just discovered via MBA (mediaCom beyond advertising) that the campaign is a team effort including mediaCom, Saatchi & Saatchi, and others). Which brings back to Paul. And I am going to share with you a secret trick I use. I use Google Alerts to track and try to learn from interesting & insightful people. I am adding Paul to my Google Alerts list along the likes of Kevin and Gary. In life, I believe an important way to better ourselves is to learn from the best. Kevin wrote years ago, “Ideas are the currency of the future.” And the likes of Kevin, Gary, and Paul are “rich people” going by the quote. And William Gibson’s quote “The future is already here — it’s just not very evenly distributed.” enlightens me to realize that the best way to look into the future is to look and see what “rich people” like Kevin, Gary, and Paul think and do! P.S. Who is your “most interesting #banff2012 person“? Please share with your reasons in the comment section. Here is the official Banff session description. 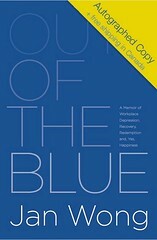 As a long time reader (and fan) of Jan Wong‘s (website, twitter) newspaper articles and “Lunch with” columns, it came to me as a total shock when I belatedly discovered the real reason of why Jan is no longer working for the Canadian newspaper Globe and Mail (she was fired from the fallout of one article) and why Jan, a successful books author and highly skilled writer, has to self-publish her memoir Out of the Blue (Amazon) (this is a story in itself). Check out this video “For my review of Jan Wong’s “Out of The Blue” & news report” and the following insightful articles and interviews. Ref: 2006 Sept article from Premier Jean Charest. Disclosure: I own shares of Manulife and I am shocked and angry of Manulife’s unacceptable business practices. Setting personal feelings aside, it is just bad business to deal with legitimate insurance clients like it did with Jan. These kind of unacceptable behaviours can rightfully drive potential future clients away. I may write a separate article about this. Will see. Well, Chinese communist party-run English newspaper Global Times decided in its journalistic “wisdom” to title Steve Jobs‘ obit as Steve Jobs: iQuit! Creative may be but creative about someone’s obit?! Yikes, too much!!! Although I’ve never set foot in Missouri School of Journalism, I am getting to know the Missouri J-School via KOMU-TV ‘s Sarah Hill and Jen Reeves. To me, the Missouri method, a “learn by doing” approach, seems like the right way to go. 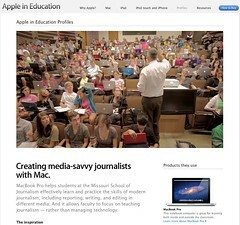 Check out this Apple in Education promo for a cool video and text info. 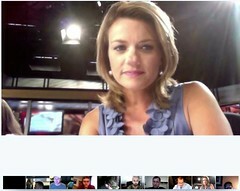 It has been my pleasure to attend a number of KOMU anchor Sarah Hill‘s interesting Google+ newsroom Hangouts since July 19, 2011. In this detailed article, I will try to share some of my general experiences, observations, and insights. To help this article flow better and less bogged down by highly technical ideas/solutions, I am gathering my technical-orientated observations and suggestions in a separate article. Since Google+ (and its Hangouts) is a new tool that is only one month old, these notes only reflect my initial thoughts/impressions. I expect my views will be changed later when I learn more. I’ve tried to reference ideas I read elsewhere as best as I can by providing crediting them and provide links to them. I first heard of KOMU and Sarah likely from “5 Ways Journalists Are Using Google+” (July 17th, 2011 Mashable article). On the internet, the location really doesn’t matter. I live in Calgary, Canada and I participated in KOMU-TV newsroom Hangouts in Columbia, MO. And through Sarah, I’ve got to know and Hangout with Angie Bailey, KOMU Anchor, Stephen Clark (Detroit, WXYZ TV), Amy Wood, (South Carolina, WSPA TV), and KOMU Interactive Director Jen Reeves. Where they are “physically located” have no impact on our interactions at all. By attending these newsrooms Hangouts, I have now hungout with people from around the world. People who joined from different parts of US, Canada, and Europe. So far, no Asian countries because of time zone differences, I suppose. Will evening news stay as “appointment television”? With the advent of around the clock news websites (often with videos) updates from major national and international news outlets (BBC, CNN, Guardian, etc), plus the local newspapers getting into the same game (with video), the evening news, especially for the younger people, are no longer “appointment television“. The viewers won’t want to be locked into watching news at a fixed time, from one news source when they can and are getting news from many different reliable sources online, whenever they want. I believe the “commodification of news” is close to done. Many news programs are working hard to differentiate their news programs by supplementing “regular” news that they must report (even most people have heard/read elsewhere) by adding special unique segments, panel discussions, etc. For example, in Canada, CBC National “At Issue” panel (a political panel of 2-3) or “Rex Murphy” segment (like 60 Minutes’ Andy Rooney). I should emphasize, I write this section with an optimistic mindset as I don’t believe not “appointment television” is entirely bad. I believe there are new ways to make money in this new time. Stories may need to be packaged differently. Ads need to be sold differently. In the next section, I will talk about two ways to make money. One thing I enjoy a lot from Sarah‘s Hangouts is the brain storming sessions. When the environment is open and the participants are engaging, the sessions can be very illuminating and productive. 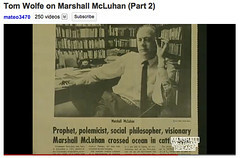 Happy 100th birthday, Marshall McLuhan in his own (and others’) words!